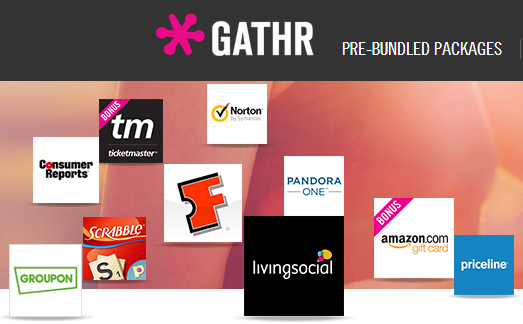 This week I received an email offer from “GATHR by AOL”. I don’t know how I got dumped into their mailing list and I’ve never heard of the service, but I decided to check it out due to a $10 discount offer. Here’s a snippet from the email that I received from them. We have been big fans of Amazon’s Kindle device line ever since we acquired a pair of the “Kindle keyboard” models a few years back. Unfortunately, earlier this year we parted ways with our trusty e-readers when they were stolen from us, mid interstate road trip. Fortuitously or not, Amazon announced its new PaperWhite device right around this same time, so we placed a pre-order and patiently awaited the launch of the new model. 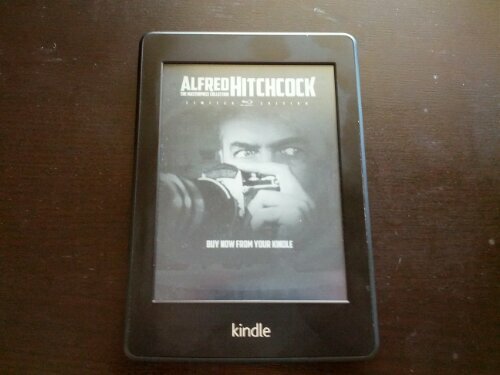 Photo below: Amazon’s Kindle PaperWhite. Over the past few months, we have been testing the Jabra Biz 2400 USB headset in preparation for this review. The Biz 2400 is a well built, premium USB headset targeted at professionals and other discerning consumers who are looking for a quality, top of the line USB headset. There are a few different variations of this device and we received the Jabra Biz 2400 MS USB Duo headset version. 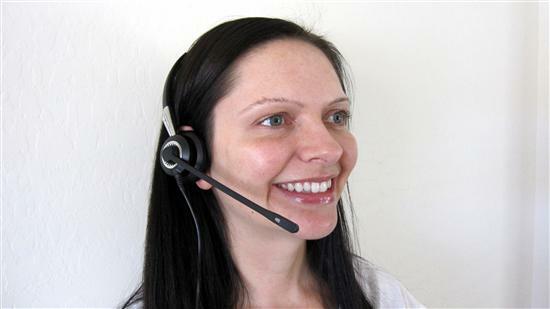 The “MS” designation in this model name signifies that this headset is optimized for Microsoft Lync (the successor to Office Communicator), which is an enterprise instant messaging and VoIP platform used by many businesses. The “Duo” refers to the fact that this is a biaural (or binaural) headset, which means that it is worn over both ears. We had our resident model, the beautiful Tera, pose with the Jabra Biz 2400 USB for a quick snapshot, shown below. For Christmas last year, Google got me a CR-48 Chromebook as part of their Chrome OS pilot program. Since then, it has been my go-to home computer for most tasks. Retail Chromebooks are now rolling out, and it’s time we take a look to see if they’re worth your hard earned dollars. If you’re familiar with using a web browser, and I assume you are, than you’re ready to use Chrome OS. In 2011, the majority of tasks performed on a home computer are all within a web browser. Google knows this, and that’s where Chrome OS came from. Why bother with background processes? Why worry about virus protection? Just open up immediately into a web browser. When I’m not at work, over 80% of my computer usage is in a web browser. The other applications I use regularly are iPhoto, Flipshare, Hulu desktop, and Pandora One. The last two could be ran in a web browser, but I like using the apps on my MacBook. Because of my usage habits, the CR-48 Chromebook fits into my life respectfully. The included Verizon Wireless 3G connectivity has also come in quite handy as I have been travelling. My only complaints with the CR-48 are with its power. It is a technological lightweight. Full screen video is choppy. Audio is shrill (even with headphones). This causes me to use my MacBook for watching Hulu and playing Pandora radio. The inability to connect a printer, digital camera or Flip camera is also a negative. I guess Google figures most pictures and video are taken with smartphones and uploaded wirelessly, so this isn’t an important feature, but it does prevent me from giving it a rousing endorsement. There are two new Chromebooks available on the market now. One is from Samsung, and the other from Acer. The Samsung Chromebook has a 12.1″ (1280×800) display, an Intel Atom dual-core processor, and an HD webcam. It sells for $429, or $499 with 3G. The Acer Chromebook has an 11.6″ LED display, an Intel Atom dual-core processor, an HD webcam, and an HDMI port. It sells for $379, or $449 with 3G. Both of these new Chromebooks have much more power than the CR-48, so the video and audio complaints above should be attenuated, or more probably eliminated. The issue with peripherals is a wait-and-see proposition. So could I recommend a Chromebook to you? Not at present. The prices for these laptops are just too high for ONLY web. I don’t buy into the tablet craze, but an iPad 2 starts at $499, and includes a hard drive, and can run loads of non-web-based applications. It’s kind of like comparing apples and oranges, but when you’re talking about a $500 purchase, you have to take into consideration what that money could provide. How much do I think a Chromebook is worth? I think $300 is a fair price for it. Just consider the Nook Color. It’s approximately $250 for a full-color tablet which can be loaded with Android for an operable tablet computer. Is a laptop with only web access worth much more than that? If there is one market segment I could give my full endorsement too, it would be the business and/or education sectors. These laptops are much lower cost to maintain than an equally capable Windows laptop, and there is much less chance that critical information is safe and secure. We’ve all heard the stories of the man who took his office laptop home only to have it stolen from his car, making the identities of his clients vulnerable to exploitation. With a Chromebook, this data is not stored on the laptop, so this information remains safe. IT administrators may also maintain the whole fleet of laptops remotely without ever having to have the laptops in their possession. All settings can be configured and maintained in the cloud. Further, users can’t install useless applications or malware on the Chromebooks, meaning there is never any down time to clean up hard drives. In education, the costs of deployment are very low, and the same administration applies. Plus, running through a local WLAN, all websites can be controlled easily to prevent students from misusing the computers. There is potential for Google to carve out a segment of the market for their cloud-only Chromebook – if they play their cards right. I use my CR-48 often without complaint. I’m just not sure the early adopters are getting a fair deal. FaceVision sent us their FV TouchCam N1 to review. 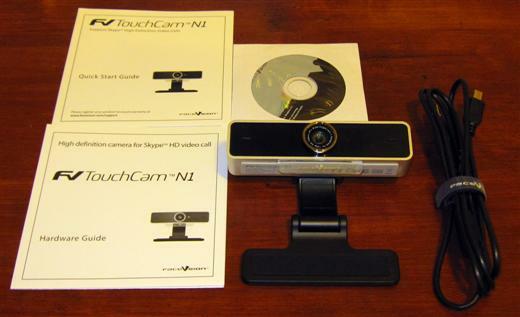 The FV TouchCam N1 is a high definition webcam that supports 720p video calling via Skype and is packed with an impressive list of hardware features. Let’s dive right into the official feature list. Description from the manufacturer: HD at anytime anywhere. FV TouchCamTM N1, a HD VideoCam with embedded H.264 encoder chip and dual microphones supporting beamforming technology, offers synchronized, crystal clear HD video (720p, 3X DVD resolution) and superior audio quality. Now Skype users can enjoy HD-quality video calling by using FV TouchCamTM N1. It helps you to build a closer relationship with friends and family or discuss with business partners effectively across difference time zones. Look Real. Feel Real. HD VideoCam supporting Skype HD video calls. HD 720p, 3x DVD resolutions. Auto Focus, up to 10 cm from the camera lens. Wide Angle lens with 78 degree FOV. Adaptive H.264 encoder for superb video experience. Unidirectional dual microphones support beamforming technique for superb audio. USB. True plug & play experience. FaceVsion FV TouchCam N1 review – What’s inside the box? As you can see, the FaceVsion FV TouchCam N1 comes with the camera itself, a mini USB cable, a hardware guide, a quick start guide and a mini CD containing Skype. Throughout this review, we compare the photo and video capturing abilities of the FaceVsion FV TouchCam N1 with our former webcam, the Logitech Quickcam Communicate Deluxe. Although the Logitech Quickcam Communicate Deluxe is not an HD webcam, we felt that the comparisons would provide valuable examples to our readers as the majority of desktops and laptop systems do not utilize a high definition webcam. To test the out the still photo capability of the FaceVsion FV TouchCam N1, we snapped many sets of photos using our Logitech cam along with the FaceVsion cam. These photos have been resized to fit well within this article, as the originals were too wide. On top, you can see a photo captured by the Logitech cam, on the bottom, a photo captured by the FaceVsion FV TouchCam N1. These photos were snapped using Debut Video Capture Software version 1.49. Looking at the photo comparison above, we see that the FaceVsion FV TouchCam N1 captures a much larger image. It’s a much wider area of capture thanks to the higher resolution. In addition to the increased captured area, it also provides a sharper image (more pixels, providing higher definition and more clarity). The image color is also more realistic and true to life. In addition to the set captured above, we shot many more still photo comparisons between the 2 webcams. Each time, the FaceVsion photos out-shined the Logitech photos by a very large margin. It’s apparent that the higher resolution and better hardware has a highly positive effect on the outcome of still image captures. In addition to the still photo test utilizing a desktop application, we compared the webcams using a real world online application. To do so, we used DailyBooth, which is an Adobe Flash based online photo sharing application. The Logitech photo is on top and the FaceVsion photo is on the bottom. Once again, we can see that the FaceVsion TouchCam N1 HD WebCam outclasses the old webcam by producing a much more vivid, more life-like image with greater detail and less distortion. To test out the internet video calling capabilities of the FaceVsion FV TouchCam N1, we placed numerous video calls to our friends over the past few months. 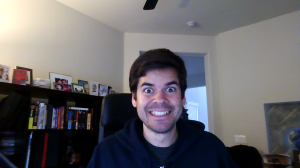 Our most recent video calls were made using Skype version 5.0.0.152. Embedded below is one of those calls that we recorded for this review. The video demonstration above makes it “clear” that the FaceVsion FV TouchCam N1 produces excellent quality video and audio during Skype video calls, much better than the majority of other webcams available on the market. Unfortunately, no matter how many times we tried, we could not get the Skype HD video calling to kick in, even after updating to the latest firmware on the FaceVsion FV TouchCam N1. We also checked the FaceVsion FAQ, taking all appropriate steps and making sure that we met all of the requirements for HD video calling, including sufficient bandwidth on both ends of the call (my internet connection speeds are 15 Mbps down, 1.93 Mbps up). To be fair, FaceVsion probably has little control over this, as it is Skype that controls and determines how the HD video calling operates and functions. Nevertheless, it’s unfortunate that the primary advertised function of this HD webcam is difficult to utilize. On a positive note, even without the high definition video calling kicking in, the FaceVsion FV TouchCam N1 still produces a very good looking video stream. Unfortunately, the FaceVsion FV TouchCam N1 doesn’t ship with any of its own software. Instead, you must rely on 3rd party software for taking photos, recording video or making video calls online. Due to this fact, we tested out a variety of common Windows webcam software options to see what type of video they could capture from the FaceVsion FV TouchCam N1. In these tests, we’re reporting on the highest possible video resolution that each application could capture with a frame rate greater than 20 frames per second. Windows (XP) Movie Maker 2.1.4020.80. As shown above, none of the applications that we tested could capture 720p (1280×720) video from the FaceVsion FV TouchCam N1. We’ve been using the FaceVsion FV TouchCam N1 over the past few months for taking photos and making videos and we’re impressed with the hardware. The images, videos and audio output that this device produces are all superb. The FaceVsion FV TouchCam N1 doesn’t ship with any of its own software, so you’ll have to make use of 3rd party software to use the device. The general compatibility with various 3rd party software products is good, meaning that every video application that we tested with was able to recognize that the FV TouchCam N1 was indeed a webcam capable of capturing some type of video. Unfortunately, the HD (720p) video compatibility with 3rd party apps appears to be poor, including Microsoft’s own Windows Movie Maker programs. It seems that most applications can only capture video from the FV TouchCam N1 at 640×480 maximum (but not in High Definition). Due to this, it appears that FaceVsion has some work to do with reaching out to Microsoft and other software vendors so that various programs will be able to utilize the full potential of the FaceVsion FV TouchCam N1. Either that, or they need to provide their own software for recording local video in 720p HD resolution. Other than the inability to take full advantage of the HD capabilities, the FaceVsion FV TouchCam N1 is impressive. Even at 640×480 video resolution, the FV TouchCam N1 can create some very good looking, high quality video. For us, it really makes things simpler for creating videos as we can just plop down in front of a PC with the FV FaceVsion N1 attached and start recording crystal clear video with the click of a mouse. It’s much easier than dragging out a dedicated video camcorder, recording video and then connecting it to a computer to upload and then edit files. The bottom line is that the FaceVsion FV TouchCam N1 is still better than the majority of webcams out there, with its high quality image production, color and audio. Just don’t expect to do much High Definition video work with the FV TouchCam N1, due to the HD application compatibility problems mentioned above. Even so, it’s a worthy webcam upgrade and we’re sure that Video bloggers, video contest participants and frequent Skype video callers will all enjoy the FaceVsion FV TouchCam N1. If you’re interested in grabbing this device, you can purchase the FaceVsion FV TouchCam N1 on Amazon. Skype video calls recorded with VODBurner. 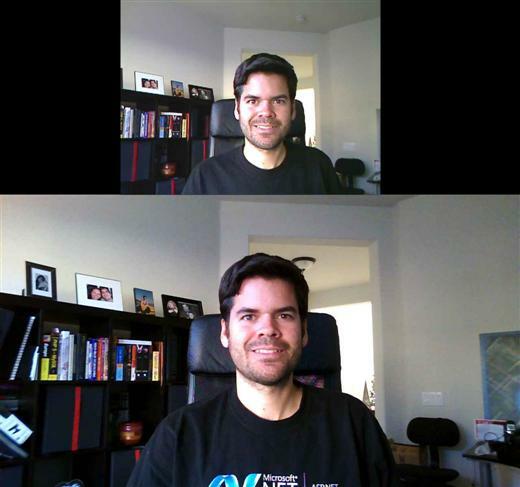 Review update: FaceVsion FV TouchCam N1 Skype HD video calls established! 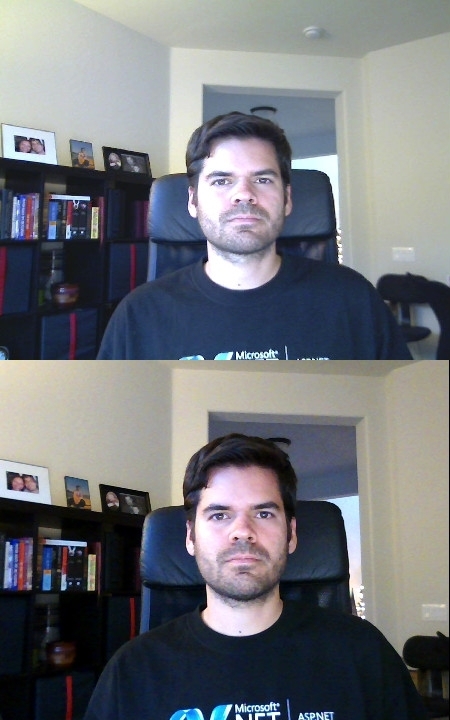 11/29/2010: After updating to the just-released Skype version 5.0.0.156, I was able to establish an HD video call using the FaceVsion FV TouchCam N1. Once a Skype video call switches into HD video mode, you’ll notice that the video changes to a 16:9 widescreen aspect ratio, as shown in the screenshot below. I also had the HD video call receiver take a Skype snapshot of my video stream while in HD mode, which you can see below (click the image to view the full HD version). Hopefully this latest Skype update makes it easier for all FaceVsion FV TouchCam N1 owners to establish HD video calls.